I gave my significant other a choice of three Sci-Fi films to watch on disc and this is the one that was chosen. It turns out to be less a film about Sci-Fi and more a film about what it means to be human, to love and to be loved. The context is definitely Sci-Fi but the narrative is all about the need to be in community, to give love and to receive love. 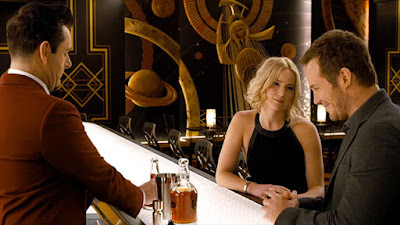 Essentially there are only four characters in this film, one of those is an android barman called Arthur (Michael Sheen), the second only features briefly (Laurence Fishburne as Gus) which leaves most of the film about Jim (Chris Pratt) and Aurora (Jennifer Lawrence). This is a visually beautiful film. All of the narrative unfolds on the spaceship Avalon which is transporting 5000 colonists who have paid for their passage to found a new colony on a distant planet because Earth is becoming over crowded and beginning to struggle to support life. The passengers are all in a state of stasis in hibernation pods. Thirty years into a 120 year journey, Jim is inexplicably woken and finds himself the only person roaming the ship. He tries to make use of its facilities but as he is only an 'economy' class passenger, many of the facilities on offer are not available to him! He does however strike up a good relationship with Arthur who it seems has spent 30 years polishing his bar's glasses. Jim, an engineer, spends his time trying to work out how to put himself back into hibernation and concludes that it is not possible. As weeks turn into months, the loneliness and isolation together with the growing realisation that he will die before journey's end, combine to propel him into a downward booze-fuelled spiral that even Arthur is unable to stop. On a drunken stagger through one of the hibernation pod halls he notices Aurora in her pod and is drawn to her beauty. Accessing the ship's files, Jim researches Aurora and views video files she recorded as part of her application process in preparation for the journey. In time he becomes infatuated with her and the idea slowly dawns, that he could wake her up and share his 'prison' with her. Although the script is in places a little clunky, overall it does a very good job of exploring the emotional turmoil the consequences of waking Aurora would have - both for her and for Jim. Jim seeks the counsel of Arthur who, although wonderfully programmed, remains an insensate android that lacks the crucial human perspective that would help Jim resist the temptation. Once the genie is out of the bottle, you can't force it back in. The film portrays a gentle, tender and believable growth in Aurora and Jim's attraction to each other. They develop an authentic relationship - not simply one born out of pragmatism given their situation. I won't spoil the plot but I will say that I was deeply moved by the situation they faced, how it developed and the outcome - so much so that my dreams were even affected by the film! I don't think I was any more susceptible to being influenced in this way when I watched the film, but for it to generate such an affective response, illustrated to me the primal nature of the story - the need for companionship, to love and be loved. The first hour of the film seemed slow to me, the second hour was over in a flash! The aesthetics of the film are very strong - including the ultimate infinity swimming pool! Special effects are very good too - particularly the weightless gigantic bubble scene! This film is filled with a wide range of emotions that the characters portray in a convincing way - the casting is spot on. The premise of the story is simple, the way it works out is plausible and the narrative arc delivers a few unexpected twists and turns. I really enjoyed this film - even if it was much less Sci-Fi and much more a good old romance story! I'll give it 8/10.